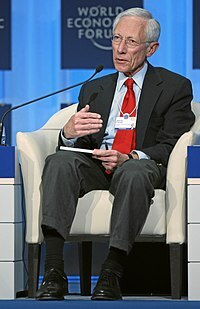 Stanley Fischer (Hebrew: סטנלי פישר‎; born October 15, 1943) is an Israeli American economist and former vice chairman of the Federal Reserve. Born in Northern Rhodesia (now Zambia), he holds dual citizenship in Israel and the United States. He served as governor of the Bank of Israel from 2005 to 2013. He previously served as chief economist at the World Bank. On January 10, 2014, United States President Barack Obama nominated Fischer to be Vice-Chairman of the US Federal Reserve Board of Governors. On September 6, 2017, Stanley Fischer announced that he was resigning as Vice-Chairman for personal reasons effective October 13, 2017. In 1977, Fischer wrote the paper "Long-Term Contracts, Rational Expectations, and the Optimal Money Supply Rule" where he combined the idea of rational expectations argued by New classical economists like Robert Lucas with the idea that price stickiness still led to some degree of market shortcomings that an active monetary policy could help mitigate in times of economic downturns. The paper made Fischer a central figure in New Keynesian economics. Through this critique of new classical macroeconomics Fischer significantly contributed to clarifying the limits of the policy-ineffectiveness proposition. Fischer was appointed Governor of the Bank of Israel in January 2005 by the Israeli cabinet, after being recommended by Prime Minister Ariel Sharon and Finance Minister Benjamin Netanyahu. He took the position on May 1, 2005, replacing David Klein, who ended his term on January 16, 2005. Fischer became an Israeli citizen but did not renounce U.S. citizenship. American President Barack Obama nominated Fischer as vice chair of the Federal Reserve System, the United States' central bank, in January 2014. In nominating Fischer for the position, Obama stated he brought decades of leadership and expertise from various roles, including serving at the International Monetary Fund and the Bank of Israel. On May 21, 2014, the Senate confirmed Fischer's appointment to the Federal Reserve Board of Governors. In a separate vote on June 12, he was confirmed as the vice chair. Fischer succeeded Janet Yellen as vice chair; Yellen became chair of the Federal Reserve earlier in 2014. Fischer resigned for personal reasons in mid-October, 2017, 8 months before the June, 2018, expiry of his term as vice chair. He is a member of the Bilderberg Group and attended its conferences in 1996, 1998 and 1999. Apparently he also attended the Bilderberg conference in 2011 in St. Moritz, Switzerland. However, his name does not show up on the list of participants for the year 2011 as of March 2016. He is also a Distinguished Fellow in the Council on Foreign Relations (CFR). Fischer was named a Distinguished Fellow of the American Economic Association in 2013. He is also a member of the Inter-American Dialogue. ^ Fisher, Stanley (1969). Essays on assets and contingent commodities (Ph.D.). MIT. Retrieved 25 May 2017. ^ Bodie, Zvi (1975). Hedging against inflation (Ph.D.). MIT. Retrieved 23 May 2017. ^ Ahluwalia, Isher Judge (1976). A macro-econometric model of the Indian economy analyzing inflation during 1951-1973 (Ph.D.). MIT. Retrieved 30 May 2017. ^ Mishkin, Frederic Stanley (1976). Illiquidity, the demand for consumer durables, and monetary policy (Ph.D.). MIT. Retrieved 24 May 2017. ^ Sheffrin, Steven M. (1976). Rational expectations and employment fluctuations (Ph.D.). MIT. Retrieved 31 May 2017. ^ Blanchard, Olivier (1977). Two essays on economic fluctuations (Ph.D.). MIT. Retrieved 1 February 2017. ^ Bernanke, Ben (1979). Long-term commitments, dynamic optimization, and the business cycle (PDF) (PhD). Massachusetts Institute of Technology. Retrieved 23 October 2016. ^ Hsieh, David Arthur (1981). Expectations and efficiencies in international markets (Ph.D.). MIT. Retrieved 27 May 2017. ^ West, Kenneth D. (1983). Inventory models and backlog costs : an empirical investigation (PDF) (Ph.D.). MIT. Retrieved 16 March 2017. ^ "A Profile of Stanley Fischer". GREG MANKIW'S BLOG. September 19, 2016. ^ Miron, Jeffrey Alan (1984). The economics of seasonal time series (Ph.D.). MIT. Retrieved 27 May 2017. ^ Bils, Mark (1985). Essays on the cyclical behavior of cost and price (Ph.D.). MIT. Retrieved 27 May 2017. ^ Romer, David (1985). General equilibrium analysis of government financial policies (Ph.D.). MIT. Retrieved 24 May 2017. ^ Caballero, Ricardo J. (1988). The Stochastic Behavior of Consumption and Savings (PDF) (Ph.D.). MIT. Retrieved 17 October 2016. ^ Sheets, D. Nathan (1993). Essays in intersectoral economics: exchange rates, public capital and productivity (Ph.D.). MIT. Retrieved 27 May 2017. ^ Goldfajn, Ilan (1995). On public debt and exchange rates (Ph.D.). MIT. Retrieved 25 May 2017. ^ Stanley Fischer firms as top choice to become US Fed vice, The Sydney Morning Herald, via Bloomberg News, December 12, 2013. ^ Ewing, Jack (12 June 2011). "Bank of Israel Chief Enters Race to Lead I.M.F". The New York Times. ^ "Stanley Fischer submits resignation as a member of the Board of Governors, effective on or around October 13, 2017". Board of Governors of the Federal Reserve System. Retrieved 2017-09-06. ^ Fischer, Stanley (1969). "Essays on assets and contingent commodities". DSpace@MIT. hdl:1721.1/13873. ^ Stanley Fischer (1977) Long-Term Contracts, Rational Expectations, and the Optimal Money Supply Rule Journal of Political Economy. ^ "Good News". Greg Mankiw's Blog. 18 May 2011. ^ "Humanitas Visiting Professorship in Economic Thought" Archived 2013-05-12 at the Wayback Machine, Institute for Strategic Thought, University of Oxford, 5–6 November 2012. ^ "Stanley Fischer, Fed Nominee, Has Long History of Policy Leadership", New York Times, March 12, 2014. ^ Mitnick, Joshua (13 June 2011). "Israel's Stanley Fischer Announces Bid to Head the IMF". Wall Street Journal. Retrieved 30 December 2012. ^ Odenheimer, Alisa (12 June 2011). "Fischer's Age, Nationality Are Hurdles in Bid for IMF Post". Bloomberg News. Retrieved 30 December 2012. ^ Klein, Zeev (19 January 2005). "Bach c'tee approves Fischer". Globes. Archived from the original on 10 March 2013. Retrieved 30 December 2012. ^ Filut, Adrian (2 May 2010). "Stanley Fischer sworn in for second term". Globes. Retrieved 2 May 2010. ^ Viniar, Olga (20 May 2010). "Israel's economy most durable in face of crises". ynetnews.com. Retrieved 23 October 2010. ^ Levy, Tal; Bassok, Moti (25 August 2009). "Israel central bank first in developed world to raise interest". Haaretz. Retrieved 23 October 2010. ^ "World's Top Central Bankers 2009". Global Finance. 28 September 2010. Retrieved 23 October 2010. ^ "Global Finance Magazine names the World's Top Central Bankers 2010". Global Finance. 9 September 2010. Retrieved 23 October 2010. ^ Wroughton, Lesley (13 June 2011). "Lagarde, Carstens shortlisted for IMF race-officials". Reuters. 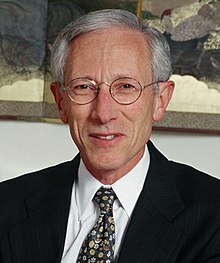 ^ "Stanley Fischer to step down as BOI chief". Ynet News. 29 January 2013. Retrieved 30 January 2013. ^ Dylan Matthews (15 February 2013). "Stan Fischer saved Israel's economy. Can he save America's?". Washington Post. ^ AP, Reuters. "Obama Nominates Former Bank of Israel Chief Stanley Fischer as Fed Vice Chairman". Ha'aretz. Retrieved 6 January 2018. ^ Liesman, Steve (2017-12-21). "Larry Lindsey being considered for Fed vice chair job: Sources". CNBC. Retrieved 6 January 2018. ^ Reuters. "Stanley Fischer Quits No. 2 Post At Federal Reserve". Forward Magazine. Retrieved 6 January 2018. ^ "Stanley Fischer: The Israeli economy" (PDF). bis.org. Retrieved 23 October 2010. ^ "Central bank governor of the year 2010: Stanley Fischer's bold moves show the value of experience". Euromoney. October 2010. ^ "Inter-American Dialogue | Experts". www.thedialogue.org. Retrieved 2017-04-11.